The Colors Of Indian Cooking: The Chaunk, The Dabba, and You: Our First Giveaway! The Chaunk, The Dabba, and You: Our First Giveaway! When Alan and I launched The Chaunk last November we set out to share my love of cooking Indian food with others and to show people how easy it can be if you have the right ingredients. I'd been cooking Indian food for about 26 years and I named my blog The Colors of Indian Cooking because to me, the Indian Spice Box or Dabba resembled a culinary box of crayons. So like any good box of crayons we started with the Basic 8. The Chaunk is now adding a Free Newsletter. Subscribe to our mailing list and you'll get access to exclusive recipes, special offers, discounts, the latest news from The Chaunk, and a chance to win a beautiful GitaDini Spice Dabba. And if you have a Spice Dabba, you'd better have some Indian Cooking Spices to go into it, so we're including a Chaunk 8 Pack to get you started! ...plus it's damn good looking!!!!! GitaDini makes a whole array of kitchen items for Indian cooking, from Chapatti tools, to Idili molds and beyond. Check out there amazing selection of goods right here. So sign up! 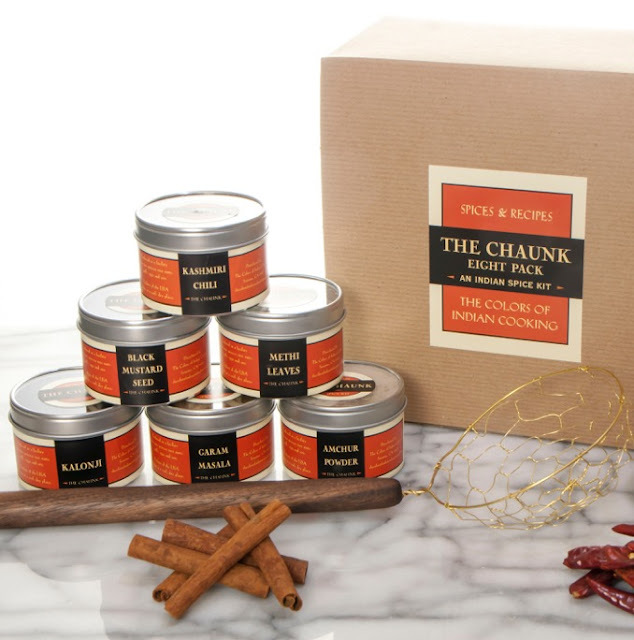 For the newsletter, and a chance to win the GitaDini Spice Dabba and The Chaunk 8 Pack! After out trip to Mumbai, Delhi, Kerala and Agra, I fell in love with Indian spices and cooking, I need to replenish my supplies! The Cookbook Junkies sent me! Weee!!!! I discovered this page because of The Cookbook Junkies! Glad you found us Alison! Also here from cookbook junkies! Jenny Hartington and Cookbook junkies sent me over to enter!